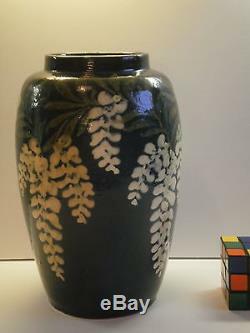 1920's French Pottery Vase by ELCHINGER et Cie. Marked FIRESIDE France and "3". Decorated with hanging white Wisteria clusters on a deep blue green background. A beautiful French Art Nouveau vase c. 10" high Base is 4.5" diameter. THere is a small chip on base. See photos for best description. PISH POSH is located in Atlanta, Georgia. We do our best to be accurate in our description. However, this does not guarantee the accuracy of our research. Hopefully, this situation will not arise. Larger furniture or fragile or delicate items will require more time. Let us know if you need it FAST, we'll do our best to accommodate. We try very hard to accurately describe our items. The item "ELCHINGER et Cie France Art Nouveau Vase Wisteria Clusters Blue Green Ground" is in sale since Monday, February 20, 2017. This item is in the category "Pottery & Glass\Pottery & China\Art Pottery\European Pottery\French". The seller is "pishposh-atl" and is located in Atlanta, Georgia. This item can be shipped worldwide.